Love is the spirit of this church. We are so glad you’ve chosen to walk your path with us at TVUUC. Choosing to become a member represents a deeper connection with and commitment to your faith community. Below is an outline of the steps on the path to becoming a member. Connection Circles are small group gatherings designed for newcomers to TVUUC and anyone who is curious to learn more and engage more deeply. They are an opportunity to share your story and ask your questions while getting to know this community a little bit better. Each session is different, so we invite you to attend as many as is helpful for you. There’s no need to RSVP, you can just drop-in at the next meeting! Connection Circles meet the first three Sundays of the month at 10 am in the Library. The upcoming session schedule is available on our calendar, and next week’s session will be listed in your Order of Service on Sunday morning. Journey-telling: Where did you come from? How did you get here? In this session, we will all be invited to share the parts of our story that have shaped us along the way. Program Focus: Lifespan Religious Education, Small Group Ministry – Hear about our offerings in Religious Education from birth through adulthood, as well as our Small Group Ministry program. Meet the Minister – Hear Rev. Chris Buice’s favorite UU joke, plus the story of this congregation and a quick history of Unitarian Universalism – all rolled into one. Church Works – As they say, “Democracy is not a spectator sport” so come to learn about how you can participate in the democratic governance of our community. Build Your Own Theology – We’ll borrow an exercise and dip our toes into articulating our existing beliefs and values as individuals. Program Focus: Fellowship, Worship, Arts & Music, Welcoming Community – We’ll meet some leaders and hear about TVUUC’s program offerings in these areas. Program Focus: Community Connections and Service, Green Justice – We’ll meet some leaders and hear about TVUUC’s program offerings in these areas. 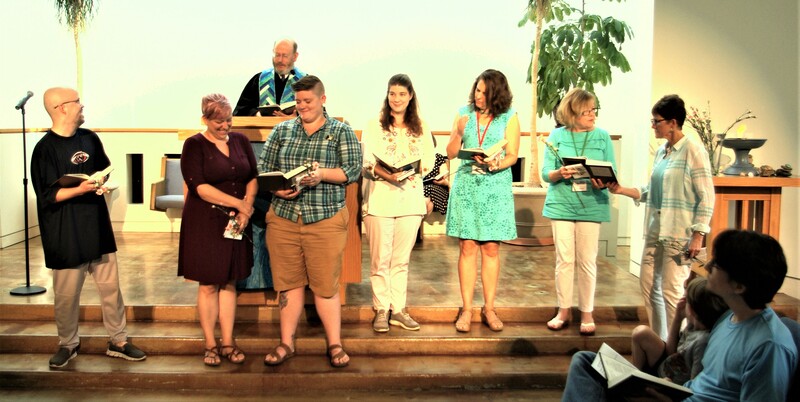 UU 101: Our Seven Principles – By now you’ve probably heard us reference the Seven Principles, or seen them on one of our rainbow bookmarks, but do you know what they mean? In this session we’ll dive deeper into the covenant that holds us together as Unitarian Universalists. Tour of the Church & Grounds – Come with us on a tour of our building and grounds. We’ll visit the spaces we inhabit and tell the stories they hold. Request a packet in the front office, receive one when you attend Connection Circles, or contact Membership & Communications Coordinator Lauren Hulse at *protected email* or (865) 523-4176 x 105. Complete and return it electronically, or drop off a paper copy in the office. The New Member Ceremony takes place during our Sunday Morning worship service. It is a brief ceremony in which the congregation will welcome you into our community. It is not required, but it is a wonderful time when we recognize those who have chosen to join the church and welcome you to our community. Step Five: Welcome to TVUUC! We are grateful that you have chosen to continue on your spiritual path with us. We look forward to welcoming you into our community, supporting you on your journey, and discovering all you have to offer. “We Are Still In” for bold, compassionate global action for Climate Justice! Sign up for our newsletter. . .